In 1998, I purchased an EG Si Hatch with intentions to swap in a B18C1 and create a competitive 1/4 mile car in my area. Turbocharging was making it's way East from the West coast and I wanted to be competitive with them, only I wanted to do it with a supercharger. I had developed a friendship with an Industry icon named Oscar Jackson and he was very helpful in making my I/H/E equipped GSR engine make 11 psi and 237 wheel HP. This combination set the bar in my area and made the car the one to beat for better than two years. Then, the wave of the turbocharger overcame me. A full engine build ensued, focusing on how to extract EVERY single HP from the M62 based Jackson Racing supercharger kit. The result: 297 wheel HP. Fun... yes... but competitive... not even close. I needed a different supercharger. Fast forward seven years and Oscar enlightened me to his relationship with Rotrex, and what this new supercharger was capable of producing. Although I knew that I couldn't make 800 HP with it, I anticipated that I could be competitive as an underdog with far less power by delivering that power in a very linear fashion. So now it was time to build a second engine... specifically to compliment the attributes of the Rotrex supercharger foundation. So, let's build an engine together !!! 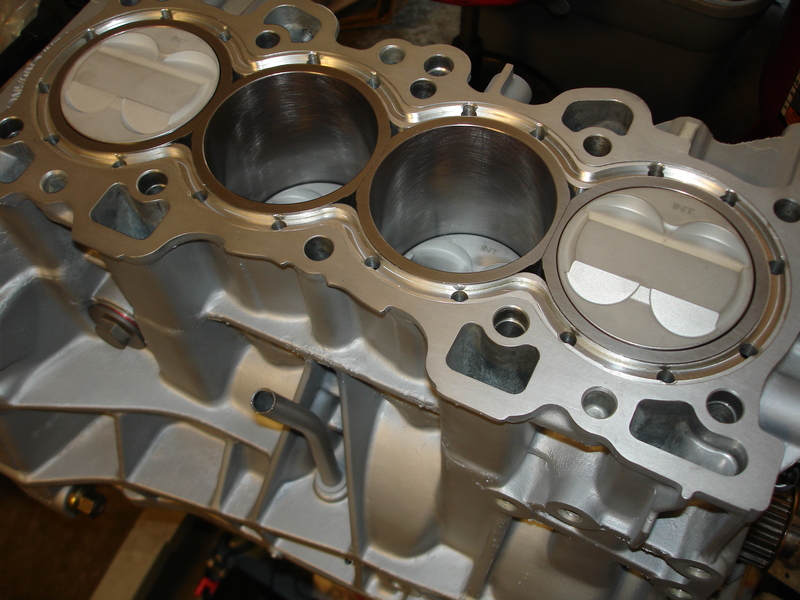 The Basics: Increase displacement, reduce reciprocating weight, and improve cylinder head air flow. 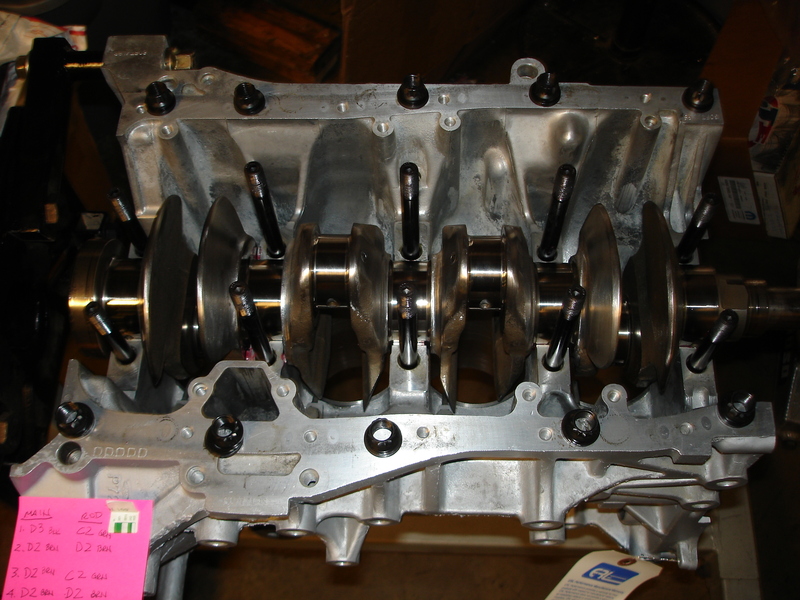 The Foundation: B18C5 Block and Crankshaft. 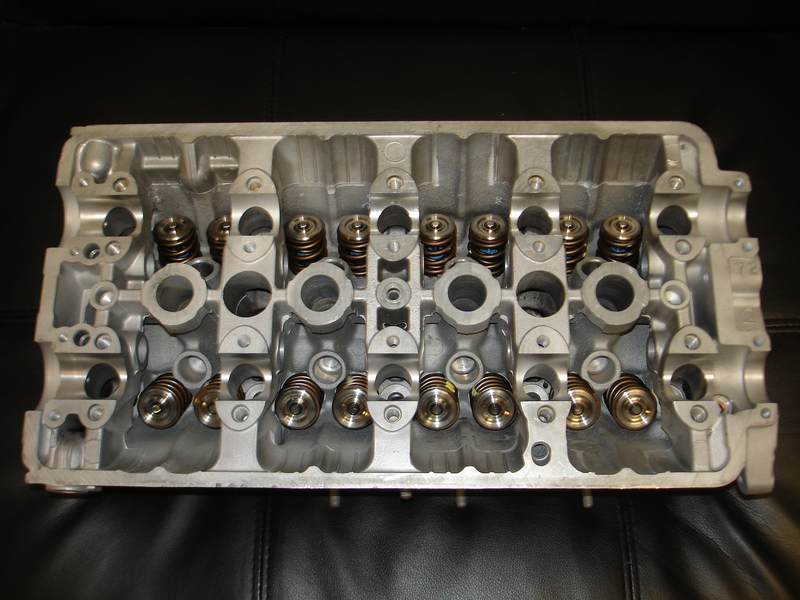 B18C1 (GSR) Cylinder Head. So let's start building shall we ?!? Since reducing reciprocating weight will be critical in making maximum power, I started there. 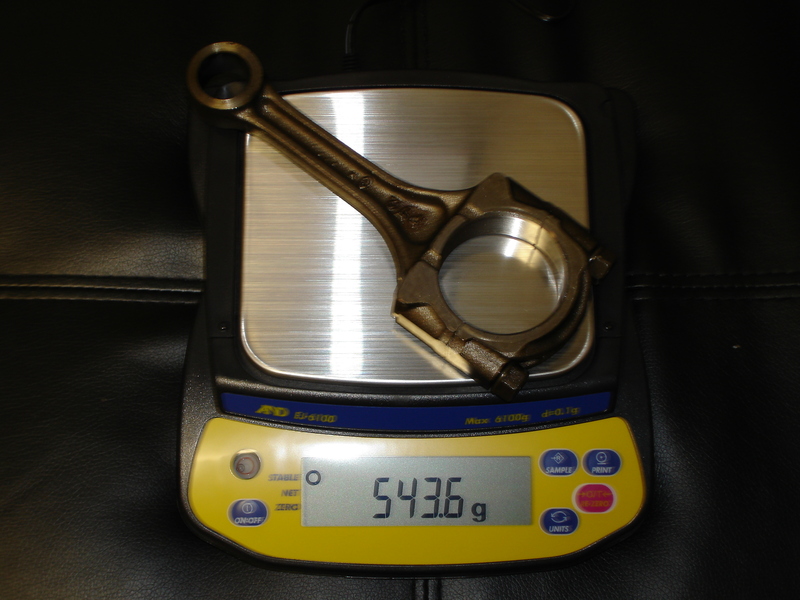 Lighter connecting rods, pistons and a knife edged crankshaft had to be constructed. I enlisted the help of Crower Industries and JE Pistons... along with a very helpful local machine shop to cut down and re-balance my crankshaft. 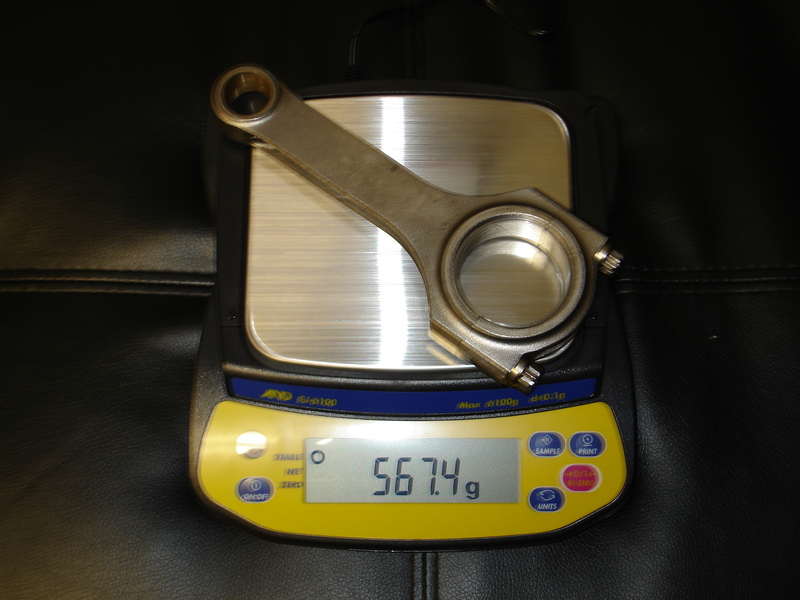 I designed a connecting rod and had Crower whittle them out of Titanium. This step saved over 200 grams per rod over an Eagle H-beam rod. Pictured are a stock GSR rod, an Eagle H-beam, and then my Crower Ti rod. Last edited by JRCivic1; 09-18-2016 at 11:02 PM. Last edited by JRCivic1; 09-18-2016 at 11:01 PM. 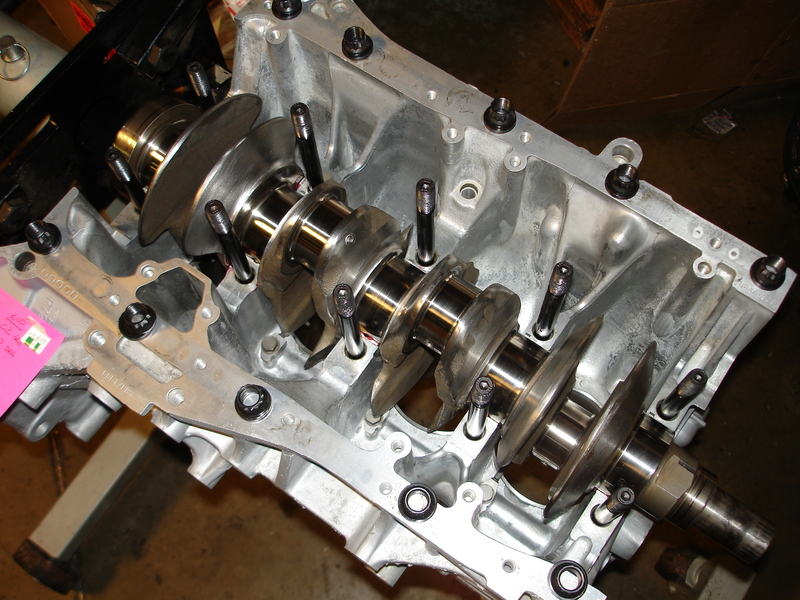 Crankshaft - I utilized a USDM ITR (B18C5) crankshaft as the foundation of the rotating assembly on this build. I wanted it to be light, so I pitched a plan to a local machinist and he agreed to help. Knife edging, teardrop chamfering all oiling holes and re-balancing the crank were the target requirements, and I have to say he knocked it out of the park. Notice in the photos that the stock crankshaft has holes drilled in the counter weights to make the balance right... since there is no place for these holes to be drilled after knife edging, balancing requires removing MORE metal on the knife edge to get it right. This is exactly how he did it. Labor intensive and time consuming... but worth it. Thank you Will Moore !!! 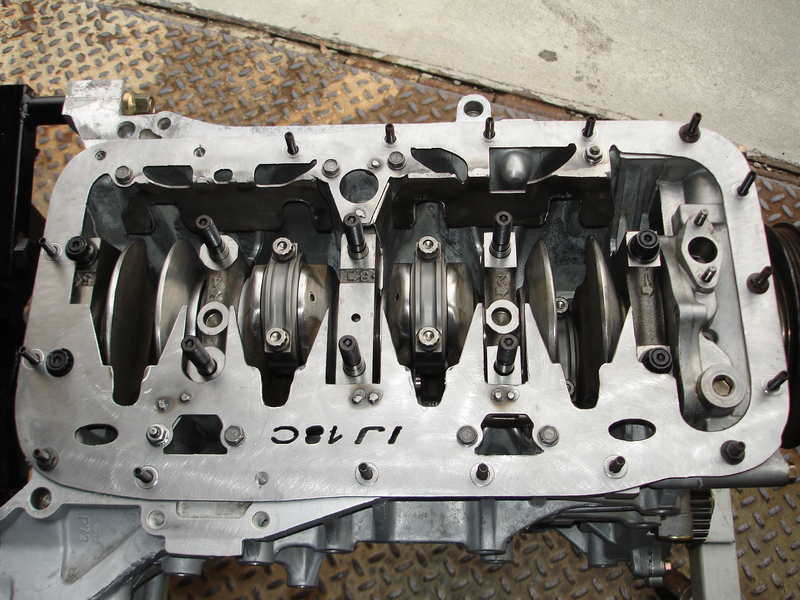 The completed crankshaft is 7.5 pounds lighter than a stock ITR crank. 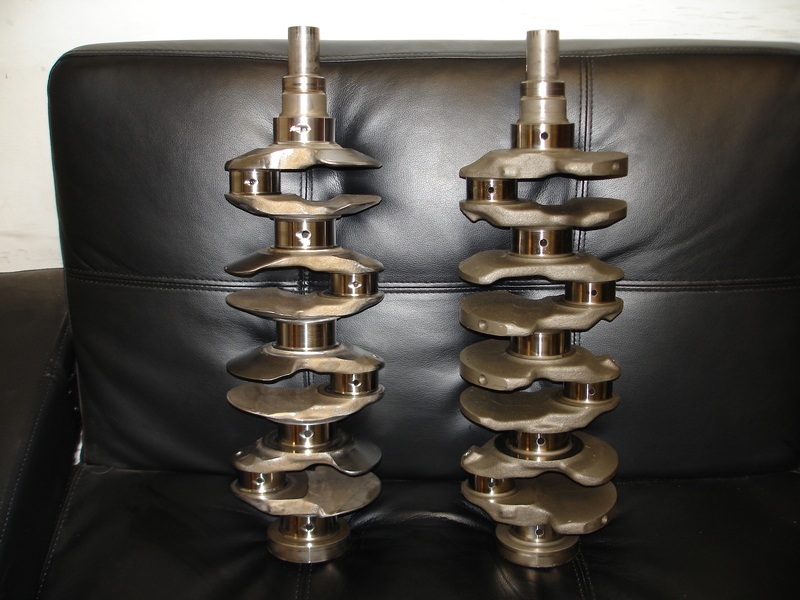 Pictured below are two pictures of the lightened crankshaft next to a stock crankshaft so that you can see the differences in counter-weight shape and size. The last pic is a close up of the work. What appears to be scratches on the rod and main journals is actually polishing rouge (smears) that hadn't been cleaned off yet. You can also see the teardrop chamfering of the oiling holes... this helps to grab more oil volume and push it toward the rod and main bearings to increase oil pressure there. 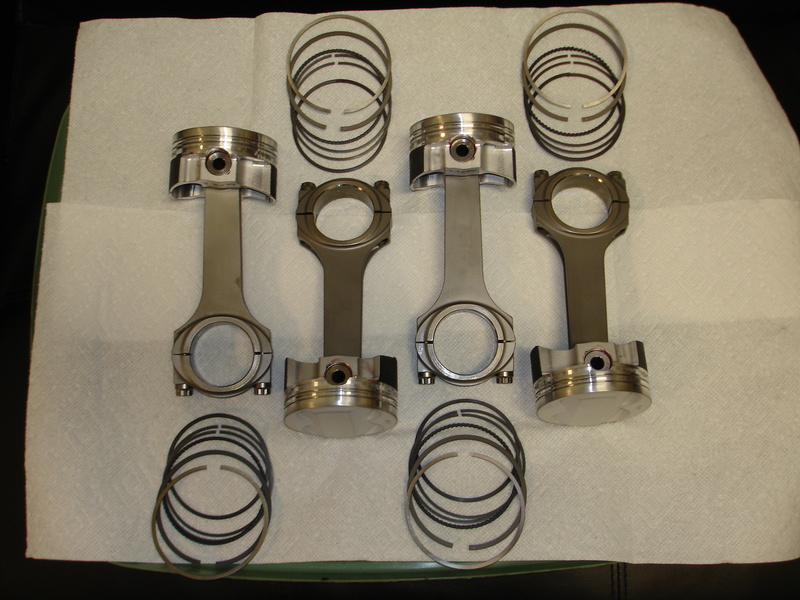 Here are the rods and pistons assembled and laid out with rings... ready to be installed into the block. Next step: Assembly. 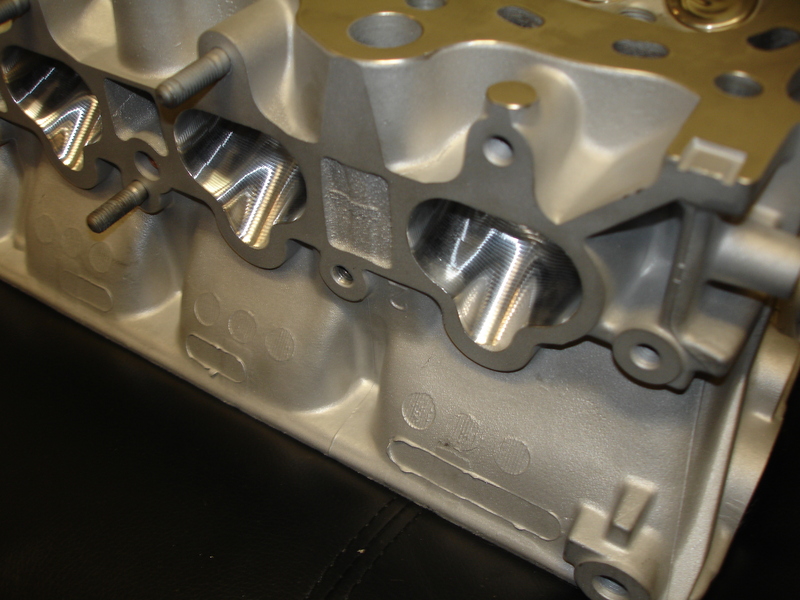 The block is a USDM B18C5 casting sleeved and line honed by ERL. They call it their "Superdeck 1" package. This includes ARP main studs too. I didn't take any pics of the block all by itself since you will see a LOT of it throughout the assembly process. Stay tuned. 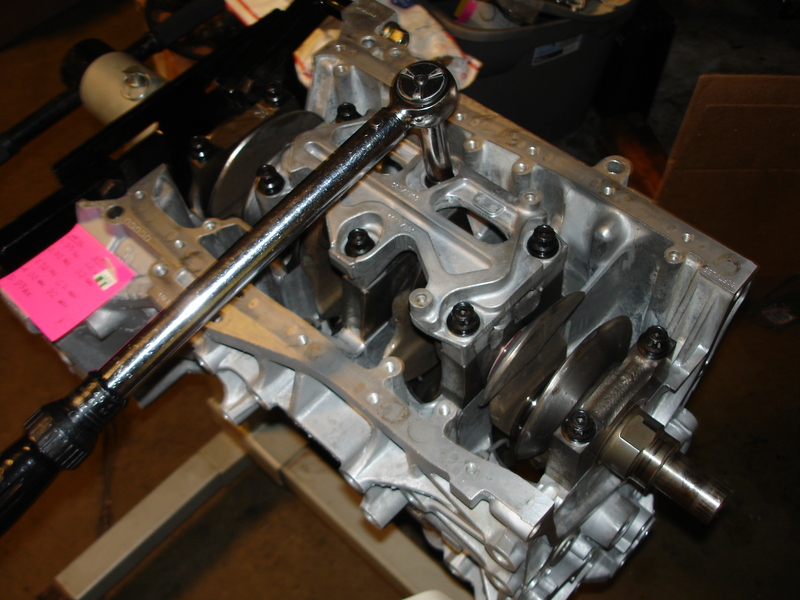 After file fitting the rings, it was time to mic the rod and main journals of the crankshaft, block and rods. Oil jets were installed. 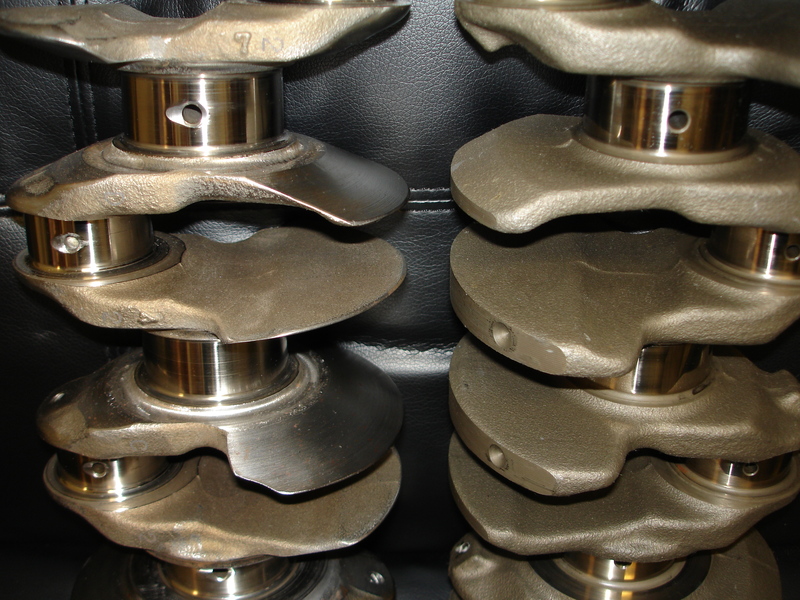 The block and crankshaft were thoroughly cleaned. Bearing shells were then carefully measured and selections were made for the specified/required oil clearances. 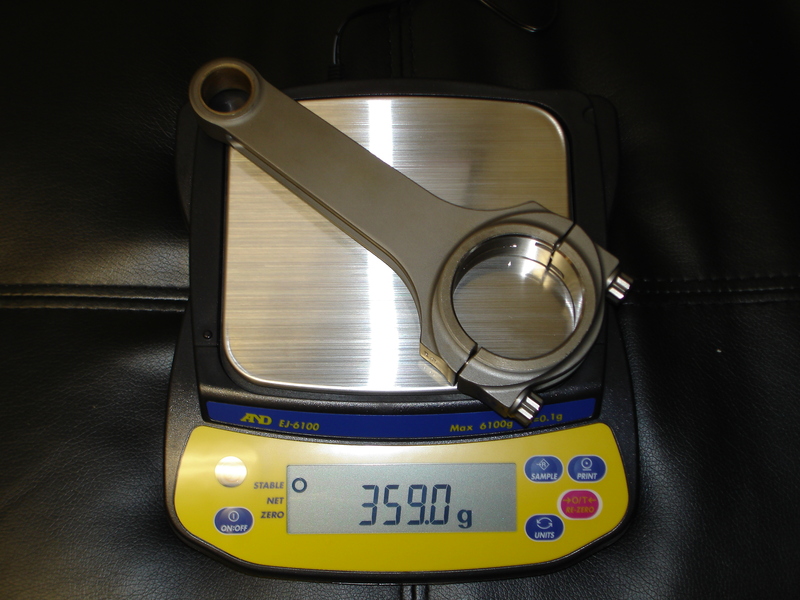 I prefer to use genuine Honda colored bearings instead of aftermarket "one-size-fits-all" bearings. I also use Redline assembly lube for final assembly. 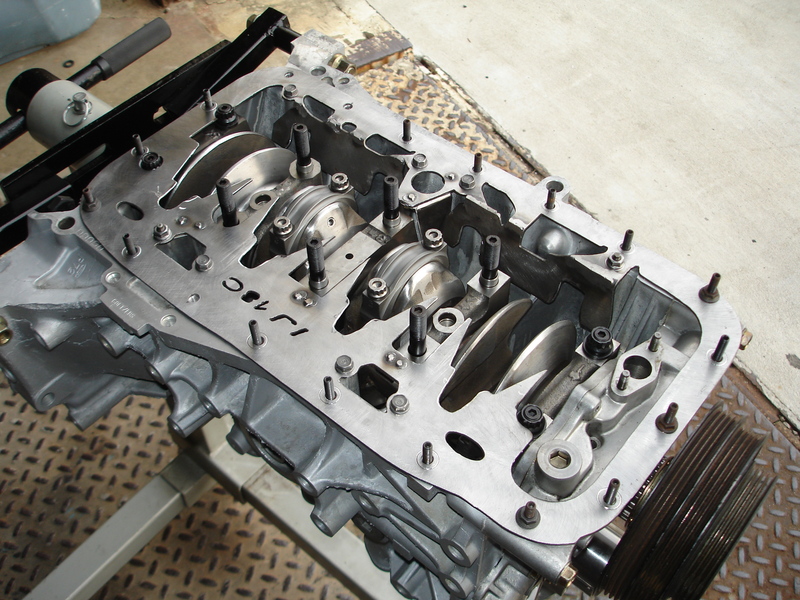 The following pictures show the initial bearing installation and laying in the crankshaft. Then main caps were installed and the ARP main stud nuts were torqued to spec. Once the crankshaft was installed and spinning freely, it was time to drop in the pistons. 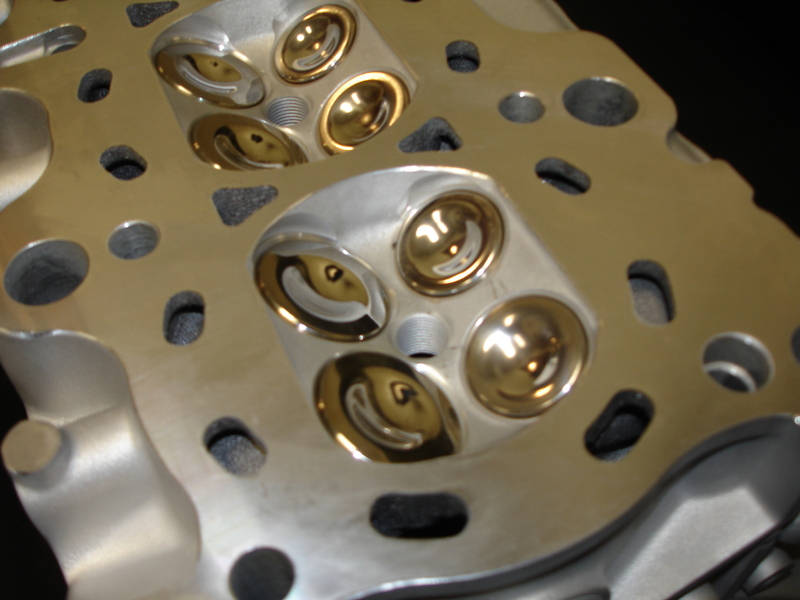 Rings were clocked, and using a Wiseco ring compressor, the pistons were slid into their respective bores. Rod bolts were torqued to spec. Rotating assembly complete. Wow. This is some amazing work. One of the most interesting builds I've come across in quite awhile. I've never seen a crank modded like that. Aradin, wait until you see the next installment... there's more neat stuff coming !!! Yeah this is impressive so far. Keep up the good work! Looking forward to more. After installing the oil pump, rear plate, water pump and front and rear main seals, I was ready for the next step. Lightening the crankshaft to reduce rotating mass and knife edging the counterweights to reduce the chop through the oil vapor cloud in the saddle of the block is just half of the solution to reducing the "windage" in the block. 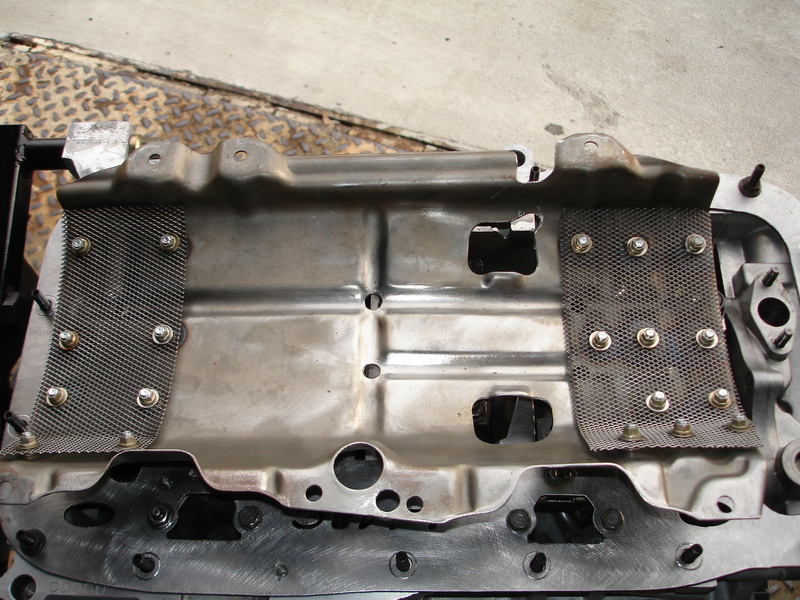 The decision was made to install a crank scraper and deflection/dispersion screens to the windage tray. 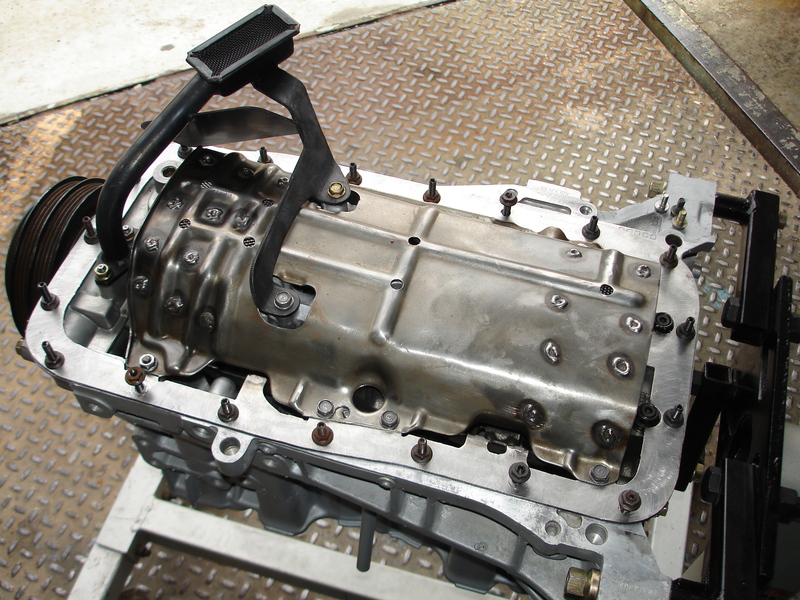 The idea is simply to reduce the oil vapor cloud inside the block... and by keeping the oil from bouncing off the windage tray and shearing liquid directly off the rods and crank counterweights, less oil is available to mix with the air inside the block... thus reducing the effort of the engine to "cut" through the offending oil vapor. This is an arduous, painstaking, process... I think I installed and removed this plate at least 30 times before I got it properly fitted. Yes, it was 13 hours of my life I will never get back... but in the end, I think it was worth it. The rod end throws of the crankshaft, rods, and rod bolts pass within .060" of the scraper plate to allow some crank movement yet still "scrape" excess oil from these parts. Also notice the screens welded to the ends of the OE windage tray... these reduce spatter by trapping any oil that hits the tray... dispersing it's effects and running it to the drain holes in the tray itself. Also note in the final picture the Moroso oil pick up... 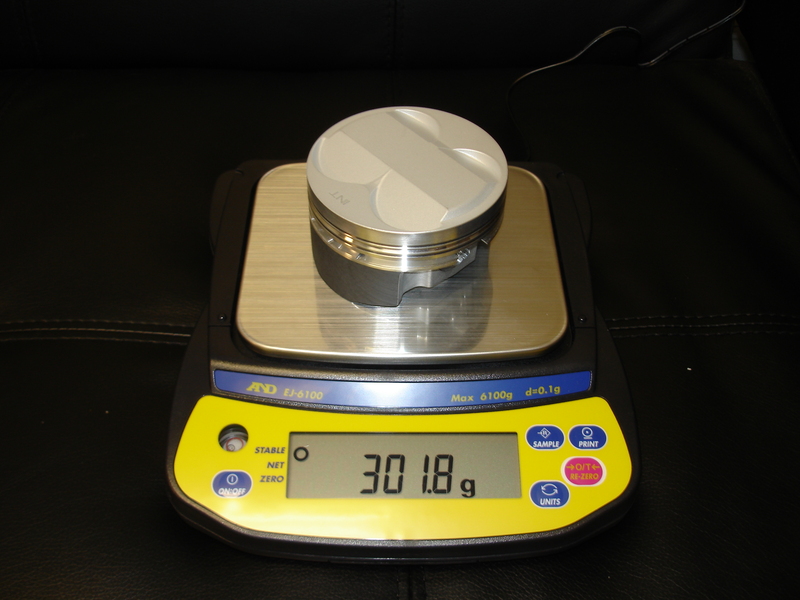 I didn't take a picture of the oil pan installed, but it is a Moroso Aluminum 5.5 qt. kick-out road race style pan with internal trap doors. Sweet man in for this! keep up the good work ! Following this thread, looking good. This will be interesting, should be a really fun build. Is it possible to use a rotrex charger and retain AC/PS? 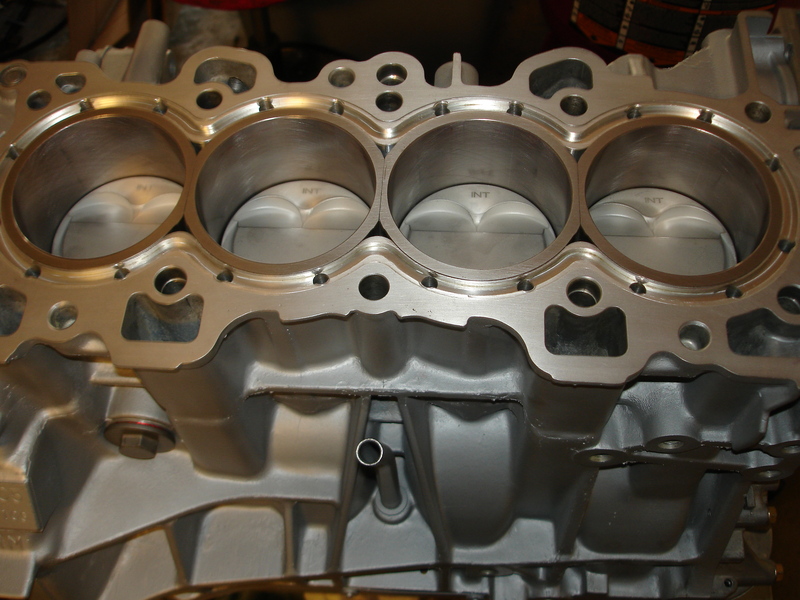 Now that the shortblock is assembled, it is time to move on to the cylinder head. I began with a B18C1 casting, sent it up to the mad scientists at 4Piston (Luke and Josh) for them to perform their Outlaw CNC port work. I also had them replace the valve guides while it was there. 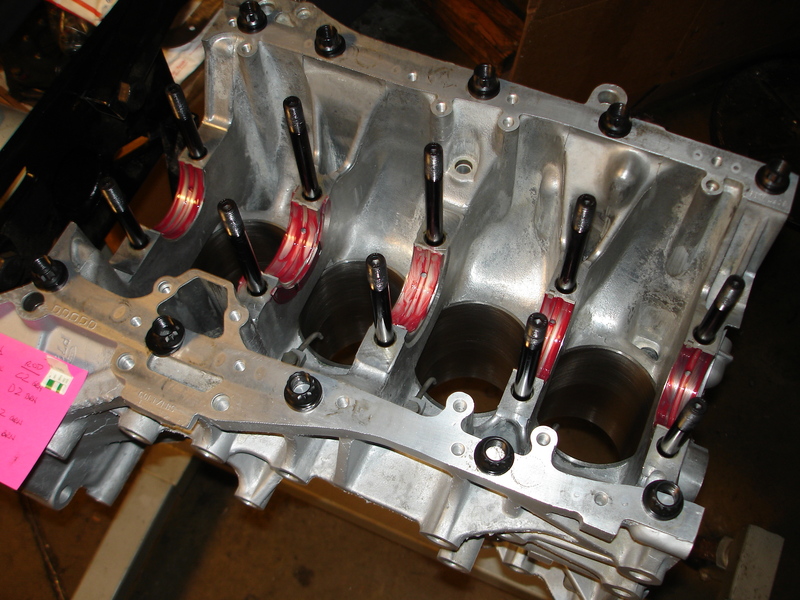 Once the machine work was complete, the head was fitted with Ferrea Competition Plus valves, keepers and valve stem seals, Crower dual valve springs and Titanium retainers. 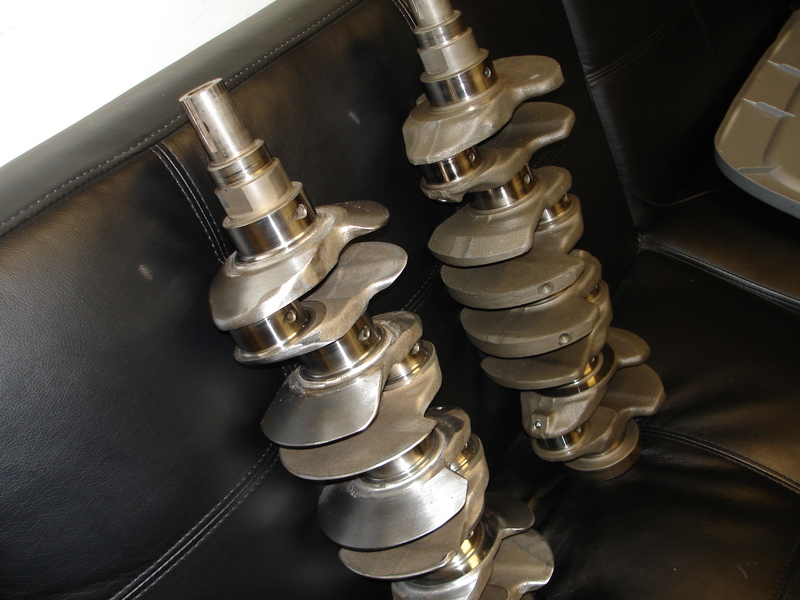 The plan was to install a really special pair of camshafts that I acquired years ago, however, when I gave 4Piston the lift specs, they checked coil bind on the head and said it simply wasn't going to work. 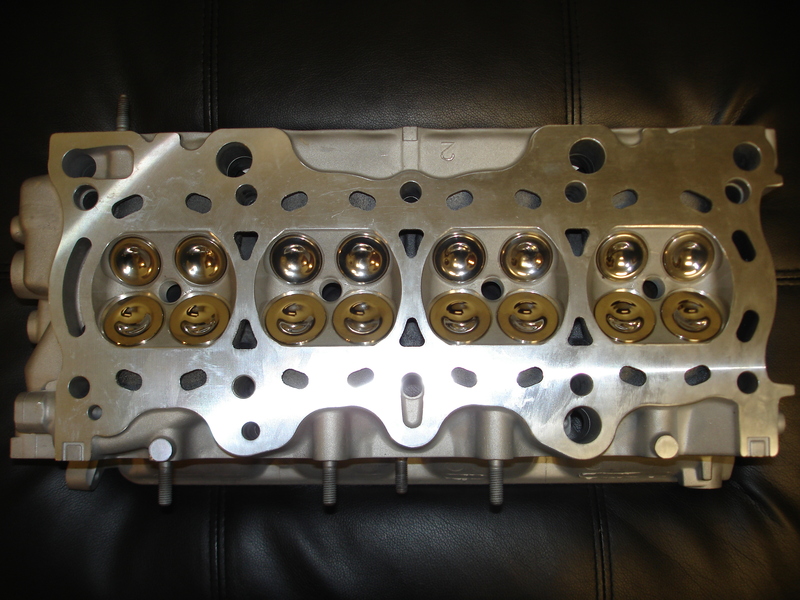 The decision was made to swap the Crower valvesprings and retainers for a set of Skunk2 Pro series XL valve springs and Titanium retainers... so this is what you will see pictured. In the end, the cam card I got for the cams didn't even come close, so I switched back to a set of conventional Brian Crower stage 2 cams. So is this the setup that made 500WHP or is this a new setup your building? 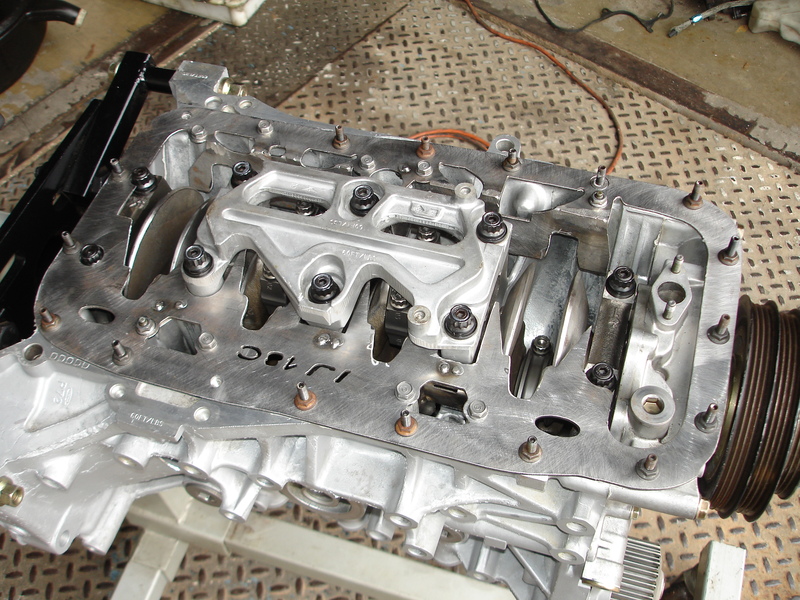 im going with a 4piston head soon too. Thanks for spoiling the ending wunfstgsr !!! Your signature kinda give it away too, lol. It's still going to be cool to see how you do this though. What about the centrifugal blowers attracts you to them? I used a Vortech on my Foxbody with the old pushrod 5.0 and am going with a Procharger on my new Coyote swap. What I like about centrifugal blowers is that you can swap pulleys to hit your boost target at whatever RPM you want instead of waiting on spool or being a slave to the characteristics of your turbo.